Upon moving to Harmony Farm, I bought guides for identifying the land’s wild vegetation. During rambles over fields and through woods, I became familiar with the green world living there. I learned the names of many species and, over time, their medicinal uses. When I first met Witch Hazel (Hamamelis virginiana), I was struck by her beauty and the timing of her flowering. 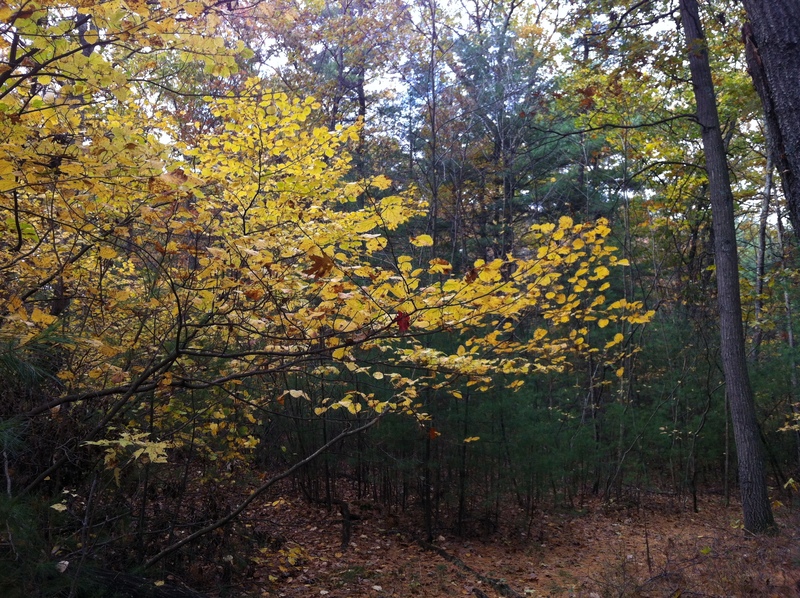 During October her leaves turned vibrant yellow and the woods grew awash with her brilliant color. Then, as fall progressed, she dropped her leaves to display delicate yellow flowers along her boughs. As time moved on, I learned the rhythms of Harmony Farm’s year and lived the cycles of her seasons. I looked forward to Witch Hazel’s burst of glory occurring while the land prepared to enter winter’s hibernation. This happened around Halloween in Medfield, MA. 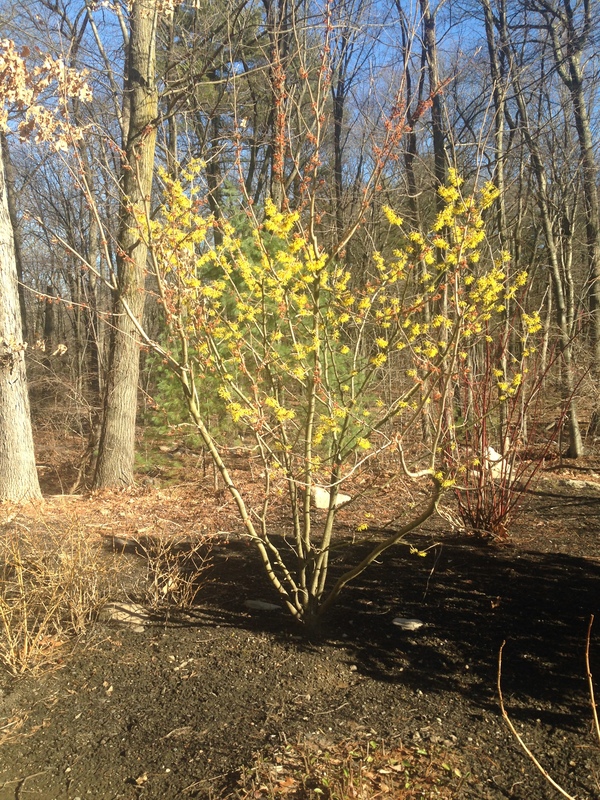 Witch Hazel’s tendency to flower during late fall, even into early winter, endeared her to me. By bursting into flower at the end of a cycle, I felt reassured that my elder years could be a time of blossoming and spiritual growth. Our move to Fox Hill Village took place during early January. Looking out the window one late February morning, a brilliantly flowering shrub caught my eye. Due to its yellow blossoms, I assumed the shrub to be forsythia and bemoaned the effects of global warming, for forsythia usually blooms in early spring. A fellow resident corrected my misconception, identifying the flowers as belonging to Witch Hazel. At first I refused to believe him, but further investigation revealed this Witch Hazel to be an oriental variety that blooms in the midst of winter. 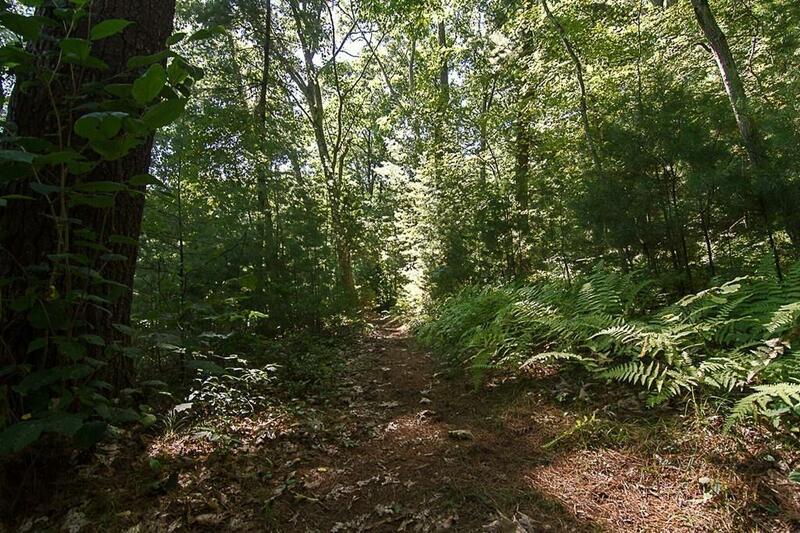 Having moved into our new home, I began acquainting myself with Fox Hill’s woods. As I rambled around this new territory, I discovered native Witch Hazel growing here too. Recognizing an old friend, I watched as she sprouted leaves in spring and when summer moved into fall, I eagerly anticipated her time of blossoming. Her leaves turned yellow and still cling to her limbs. As I take my walk each day, I now study her closely, searching for signs of flowers yet to come. Halloween nears and this will be my first time participating in Fox Hill’s yearly celebration, a costume party. I decided to adorn myself in Witch Hazel garb – her leaves and, hopefully, flowers too. As I celebrate beginning the last phase of life, I look forward to my own blossoming. I eagerly anticipate a season of spiritual growth and flowering. Bill and I planned to live out our lives on Harmony Farm. When we contracted for long term care insurance, we insisted that it cover in-home care. We built a separate building, “the studio”, with our elder years in mind and even investigated whether it might be possible to be buried on our property. I cherished living in harmony with the seasons. During summer months we slept with windows open, falling asleep to night-time sounds of owls hooting and awakening to our rooster’s loud crowing. We gardened, swam in the pond, walked in the woods, gathered herbs, picked fruit and harvested food. As weather cooled, we moved more inside, yet stayed connected to nature by eating food reaped from our gardens and continuing to care for the land. As yearly cycles progressed and I anticipated turning 70, I began re-thinking our earlier plan. While Harmony Farm’s natural setting served us well during years of vibrant health and boundless energy, our bodies’ creaks and groans had become increasingly louder. Activities such as chain-sawing fallen trees and shoveling snow had once felt deeply satisfying. We enjoyed the physical work and felt smug about our useful accomplishments. Now inner wisdom screamed “caution,” warning of their price. It took a while, but we finally admitted that we no longer thrived on the challenges of caring for our land. Swallowing our pride, we hired others to plow the driveway, shovel the snow and handle heavier jobs on the farm. Concurrently, I began realizing that while the solitude of our home provided respite from the hectic pace of modern life, its isolation might prove too lonely in the years ahead. On my walks through the woods and while sitting by the pond, I reflected on what the future might bring and opened my heart to the possibility of change. On one of my daily walks, I stopped, breathed in the earth-pine smells and looked around. I noticed abundant ferns growing on both sides of the trodden path beneath the canopy of trees. Light filtered down, nourishing the green world and me. All of a sudden, a thought flashed into my mind. Like plants and trees, whose roots support and interconnect with one another, I need to live in community during my elder years. Stunned by the enormity of this idea, I sank to a nearby log. And sat. Just sat. Enveloped by the aroma of mossy dirt, I contemplated what this change would mean. Moving away from Harmony Farm – could I bear to separate from this beloved land? Adopting a different life style – what might that look like? Downsizing – how to choose what to keep and what to release? Searching for safety, I hunkered down further to feel the solidity of the log beneath my buttocks and legs. Supported by the log, I focused on my breath, consciously breathing in and out, in and out, in and out. After quite a while, the surges of feelings slowed, then stilled. I calmed and decided to tap into the earth below my feet. Sending tendrils of awareness down, I sensed the vast network of mushroom mycelia running underground – between roots and rocks, hither and yon, connecting plant to plant, tree to tree, spreading out like a spider’s web, reaching far and wide. Reassured by the reminder of interconnectedness, I realized that no matter where I live I would remain connected to Harmony Farm. And wherever I go, I will always be able to connect with nature. I finally roused myself and slowly walked toward home along the woodsy trail. Passing the pond, I again felt pangs of what would be missed if we were to pull up roots and move. Yet as I watched the water trickle and bubble its way downstream, I considered entering life’s current and seeing where its flow might take me. Anticipating what living in community might bring, a tinge of excitement sparkled deep within. Returning home, I decided to wait a few days before discussing my insight with Bill. I sat with my feelings and imagined living in close proximity with other people. What might that feel like? Where might that be? What kind of community? When I shared my thoughts with Bill, he initially refused to consider moving from Harmony Farm. Over time, he gradually opened his heart to embrace the wisdom of living cooperatively with others. And so began our next chapter.